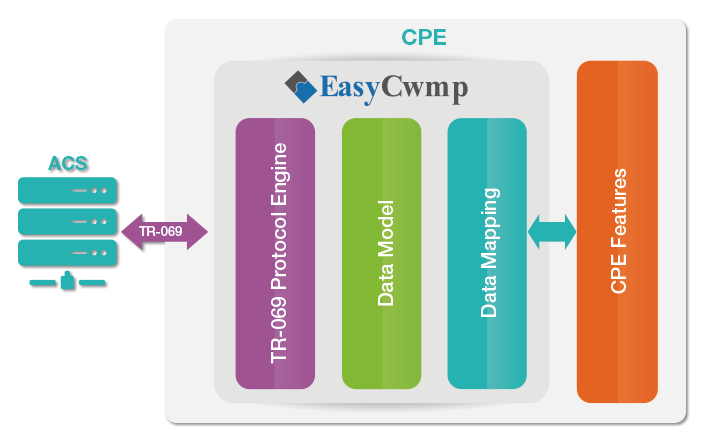 EasyCwmp is a GPLv2 open source implementation of the TR069 cwmp standard. EasyCwmp is developed by PIVASoftware. The aim of this project is to have the first open source fully compliant with the TR069 CWMP standard. The EasyCwmp design includes 2 parts: EasyCwmp core and EasyCwmp DataModel. The key design goal is to separate the CWMP method execution from the CWMP engine. That makes easy to add and test new features. For both solutions, the management of EasyCwmp data model is very easy. PIVASoftware offers premium packaged Data Models (TR98, TR181 and TR104) with C solution and Shell solution. Design Flexibility make it suitable with any device. Separation between the Engine and the DataModels make it clear and robust. Availability of good documentation with howto for easy use. All required TR069 standard methods are supported. Integrated file transfer support (HTTP, HTTPS, FTP). Dependencies are libcurl,, libc (uClibc, glibc), OpenSSL (optional), microxml. Professional contract for support and maintenance. DataModel in C: highly recommanded for big DataModel.